The Delta viewed from above Sherman Island, with the Sacramento River above and San Joaquin River below. SACRAMENTO, Calif. (CN) – Environmental organizations sued the California agency in charge of managing a massive water project Friday, saying the state illegally altered the Sacramento-San Joaquin River Delta management plan to favor the project over environmental restoration. Friends of the River, the Center for Biological Diversity and four other groups say the California Delta Stewardship Council’s amendments to the Delta Plan, which pave the way for construction of two massive underground tunnels capable of sending billions of gallons of water north to south, come at the expense of the delta’s sensitive environment. 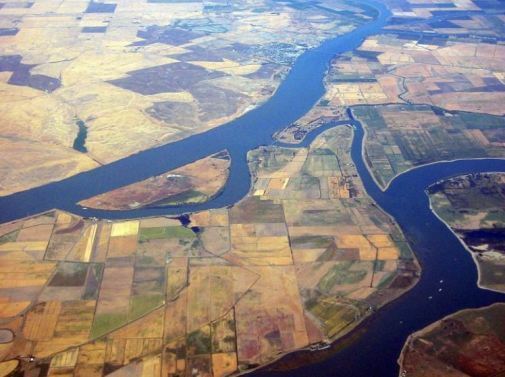 The suit comes at a time when the delta tunnels project, officially known as California WaterFix, moves closer to breaking ground as major water districts across the state have recently approved underwriting the majority of the project’s $17 billion price tag. Endorsed by Governor Jerry Brown, the project calls for the construction of two four-story tunnels stretching 30 miles under the delta. Brown and project proponents say the project will help the delta’s environment by improving the water transfer infrastructure in California. Currently the Central Valley Project, run by the federal government and the California State Water Project, use a series of dams, tunnels, channel diversions and water pumps to move water from Northern California south. The pumping systems, in particular, are hostile to native fish populations, especially the endangered delta smelt, according to many fish scientists. Brown and others say the tunnels will move water without pumping, improving conditions for fish and other species in the delta. But environmentalists are wary, with some calling it a water grab by Southern California, with the interests of the dry farms in the south part of the state thirsty being put ahead of improving conditions for wildlife. “It goes to show how thoroughly Big Ag and Big Money own our state agencies, and it’s time the people – and our elected representatives – rise up and end it,” said Adam Keats, senior attorney with co-plaintiff Center for Food Safety. Specifically, the groups point to the Delta Reform Act of 2009, which created the stewardship council, guides restoration in California critical river delta system and sets various water quality standards and water reliability provisions. According to the groups, the agency also failed to adhere to a separate state law that says access to safe and clean drinking water is a basic human right by approving the delta tunnels plan. The Delta Stewardship Council did not respond to a request for comment by press time. The groups seek an order vacating the Delta Plan amendments and environmental impact reports, and the suspension of any work being done on the project until the Delta Stewardship Council has fully complied with the California Environmental Quality Act, or CEQA. They are represented by Friends of the River attorney E. Robert Wright and Center for Biological Diversity attorneys John Buse and Aruna Prabhala.